Deals in the automotive industry are usually met with suspicion or complete disbelief. "No one ever actually gets that price" is something every car buyer has said at one time or another when presented with "0 down, 0% interest, $199/month" TV, radio, or print ads. And most of the time they're right. Rarely does anyone actually get those prices. NowCar wants to change that, though. Leading up to the launch of our complete online solution to car buying, we're launching "Steal of a Deal," a promotion to give car buyers exclusive deals—that are actually deals. No gimmicks, no hidden fees, and we put the fine print right on the page. The first deal we're featuring is a new lease on a 2015 Chrysler 200 Limited—a vehicle with an MSRP of $24,480. Current lease holders can get a brand new Chrysler 200 Limited for just $195/month with $195 down. New lessees can get it for $219/month with $219 down. Overall, that translates to $6,653-$7,653 in discounts and rebates! That doesn't include monthly sales tax, but we take care of everything else—including delivery of the vehicle directly to your home. The only downside to this deal is that we can't offer it to everyone in the U.S. The Steal of a Deal promotion will only be available to car buyers in the greater Fort Myers, Jacksonville, Orlando, and Tampa areas in Florida. Like many online startups that hope to disrupt big business, we have to start small and scale up. Of all of the problems with dealer-advertised lease deals, the biggest is qualification. Typically, you need to have one of the highest credit scores possible to claim the best price and final payment. For the average person, that credit score is simply out of reach. With NowCar's Steal of a Deal, however, we've made qualifying possible for a lot more of today's new car buyers. You simply need a 680 (or higher) credit score and stable income. The first thing that should be noted about the 2015 Chrysler 200 Limited is that it's not the base model. With a lot of deals, the price is based on the most inexpensive model, meaning you won't be too impressed with its features. Redesigned for the 2015 model year, the Chrysler 200 is now one of the best-looking mid-size sedans on the market. Given a sleeker, aggressive, and overall more refined exterior, the 200 looks like a premium sedan, but actually costs less than the 2014 model. 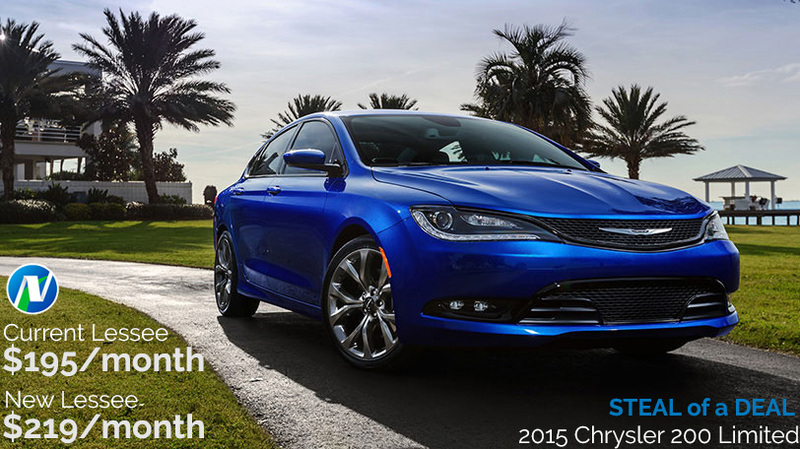 For full details on the 2015 Chrysler 200 Limited and NowCar's Steal of a Deal promotion, click the button below!